13.9" x 14.6" stitched on 14 count. 10.8" x 11.4" stitched on 18 count. 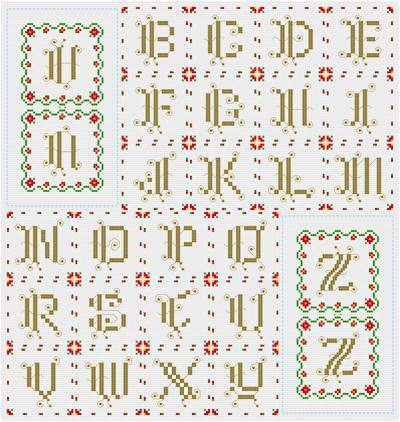 Ornate Monograms - Poinsettia Edge cross stitch pattern... ORNAMENT/GIFT TAGS - These monograms sparkle. Border for each letter contains poinsettias. Designed for easy placement. May be ornaments or gift tags. Instructions for making two sided ornaments given. Fabric color may change.